Since the very beginning, Confucianism has been troubled by a serious gap between its political ideals and the reality of societal circumstances. Contemporary Confucians must develop a viable method of governance that can retain the spirit of the Confucian ideal while tackling problems arising from nonideal modern situations. 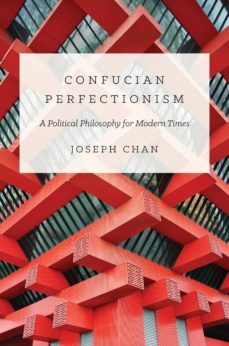 The best way to meet this challenge, Joseph Chan argues, is to adopt liberal democratic institutions that are shaped by the Confucian conception of the good rather than the liberal conception of the right.Confucian Perfectionism examines and reconstructs both Confucian political thought and liberal democratic institutions, blending them to form a new Confucian political philosophy. Chan decouples liberal democratic institutions from their popular liberal philosophical foundations in fundamental moral rights, such as popular sovereignty, political equality, and individual sovereignty. Instead, he grounds them on Confucian principles and redefines their roles and functions, thus mixing Confucianism with liberal democratic institutions in a way that strengthens both. Then he explores the implications of this new yet traditional political philosophy for fundamental issues in modern politics, including authority, democracy, human rights, civil liberties, and social justice.Confucian Perfectionism critically reconfigures the Confucian political philosophy of the classical period for the contemporary era.